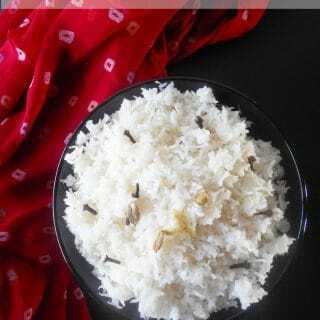 How to Make Basmati Rice Like They do in Indian restaurants? 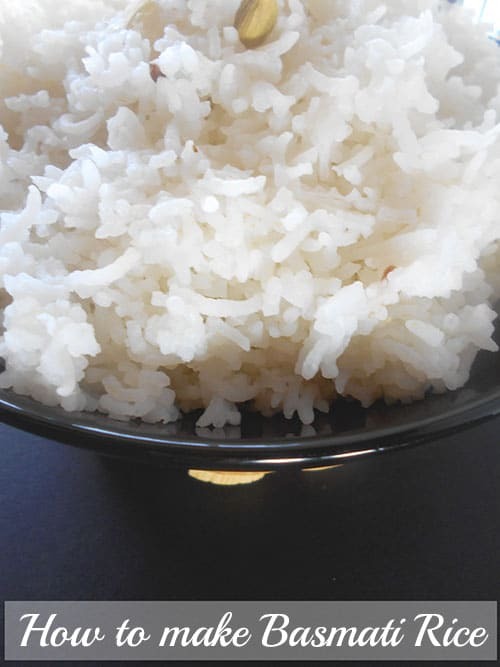 It is Very Simple to Make and the Rice Cooks in Less than 30 Minutes. I am basmati rice snob and a connoisseur. Everything about basmati rice makes me happy and the perfectly cooked rice is not very hard to do. The first reason is that they are made in bulk, so, it costs them about $1 per day to make the rice. For this reason, they can give it away for free. The second reason is probably the better reason.. Restaurants think that if they give you free rice, you will eat more entrees. Since entrees are where they make the most of their profit, it is a fruitful tactic. 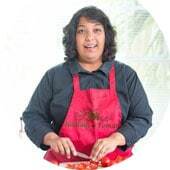 So, the next time you are looking to make easy dinner recipes, try this basmati rice technique. Also, if you have a rice pudding recipe, use this method of cooking rice. Your pudding will turn out nice and soft. 2) First, we need to wash / rinse the rice. 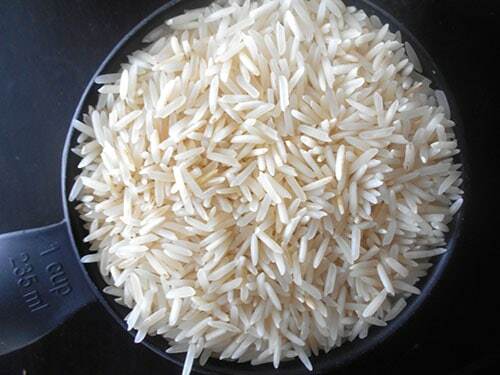 In a medium sauce pan, add 1 cup of Basmati rice. 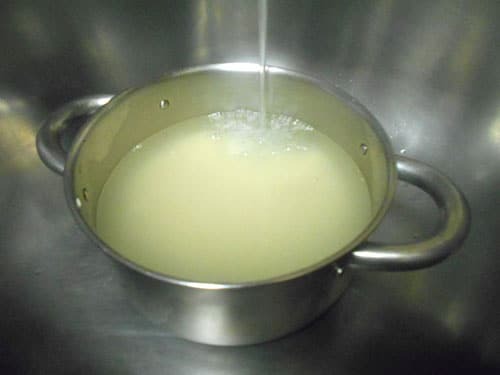 Place the pan under your kitchen tap and fill it with water. There is no measurement for this because we are rinsing the rice. I like to fill it about half way through. 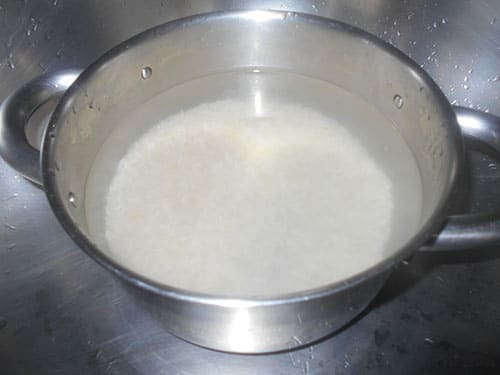 3) Using your fingers, gently stir the rice and water. You will notice that the water will get cloudy. That is a good thing. It means that the rice was packaged right after harvesting. Tilt the pan and remove as much of the water as you can. It’s ok to leave some water in it. 5) Once rinsed, we now add water that will be used for cooking the rice. The general ratio rule is 1:5. For every cup of rice, add 5 cups of water. 6) Place the pan on high heat. 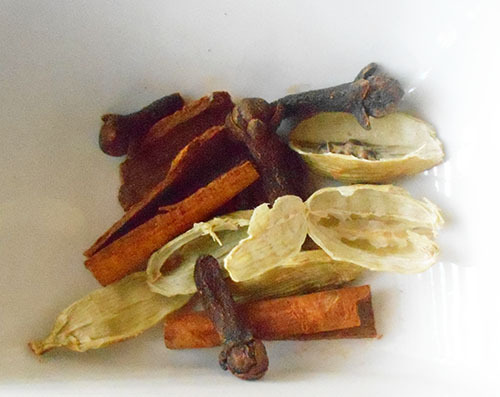 Add the cloves, cardamom, cinnamon and ghee or oil. 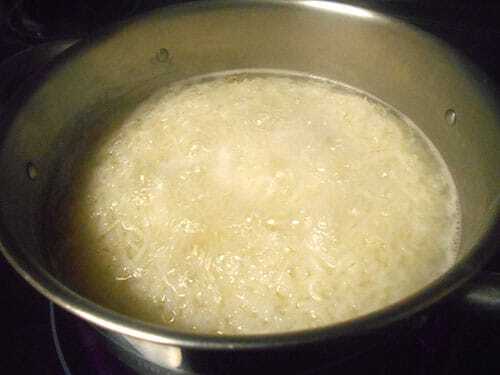 7) Stir frequently so that the rice doesn’t stick to the bottom. I like to use a fork to stir because it fluffs the rice. 8) When the rice grains have doubled in size (about 15-20 min), your rice is ready to be taken off the heat. 9) Next comes the removal of excess water. I like to use a nylon strainer because it catches all the rice. If you don’t have it, use a colander or any strainer with holes that are tiny. Using your fingers, gently stir the rice and water. 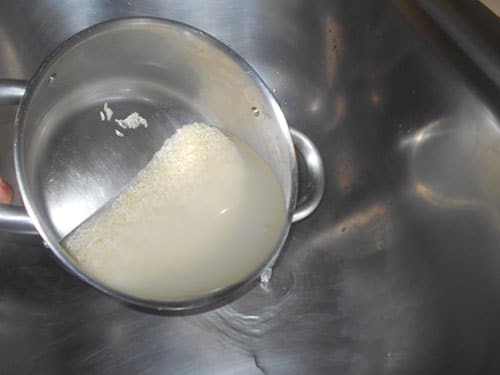 Tilt the pan and remove as much of the water as you can. It's ok to leave some water in it. Place the pan on high heat. Add the cloves, cardamom, cinnamon and ghee or oil. - If you are using Saffron, soak the 2 strands in 3 tsp of warm water. After 4 min of soaking pour the saffron water over rice and stir it. Some of the rice will turn red, some will be yellow and the rest will be white, just like they are in Indian restaurants. Perfect rice! Thanks for the tips! I go back and forth between basmati and jasmine rice. Brown rice too! Thanks for the step by step instructions, this rice sounds delicious and must be so wonderfully fragrant, I can’t wait to give it a try! Thank you, Joy. 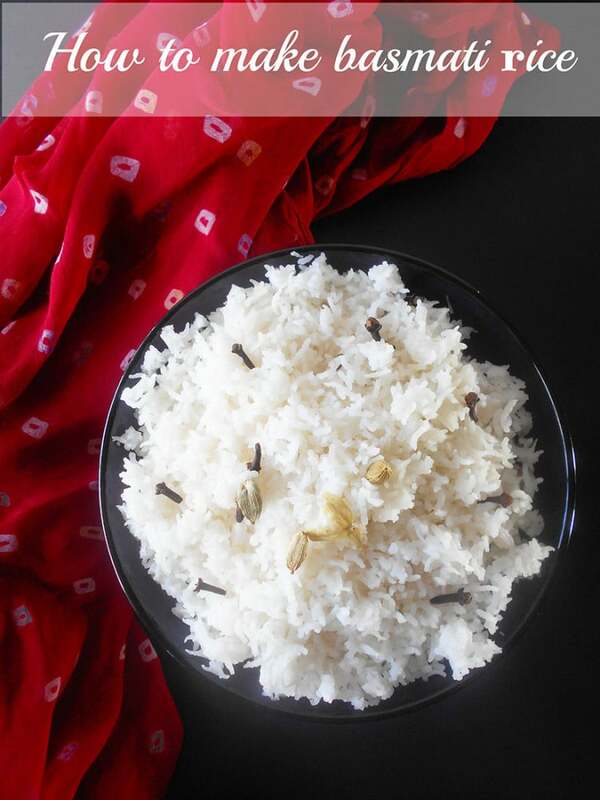 I think you will really like this recipe for rice. You mention cinnamon sticks twice in the ingredients list. Is it supposed to be like that? Those flavors infused in there sound wonderful. Great way to jazz up some rice. Great instructions. I had no idea you needed to wash the rice first. Thanks. Thank you, Shann. It helps get rid of some of the aftertaste. Thank you, Lizzy. When we make rice, we always add cloves and ghee. The other 2 spices are reserved for special occasions. 1 to 7? Really??? WOW, that I did not know. Love the spices you’ve used. Thank you, Michelle. Yes, if you want light and fluffy rice, you have to have that much water. Love the step by step directions. I did not know about cloudiness & packaging, love learning something new! Thank you, Debra. I like freshly harvested rice. I am looking forward to trying this, though I usually make my rice in a pressure cooker as it’s much quicker. I am confused, though. In your directions you give the 1:7 ratio, but in the recipe you say 2:5. Thank you, Jan-marie. I am so sorry about the mix-up. The ration is 1:7. Not sure how it got changed in the recipe. I went back in and corrected that error. Thank you so much for bringing it to my attention. Basmati rice is my favorite rice, love your tutorial going to make it now! What a wonderful tutorial this is! I always wash my rice several times before washing it too and it makes such a difference in how it cooks! Thank you, Shannon. You are so right. I can always know when they I taste rice that is not washed. What a great tutorial. I am feeling a little stupid because I have never even thought to wash my rice before cooking it. Thank you, Sandi. No, you are not stupid! 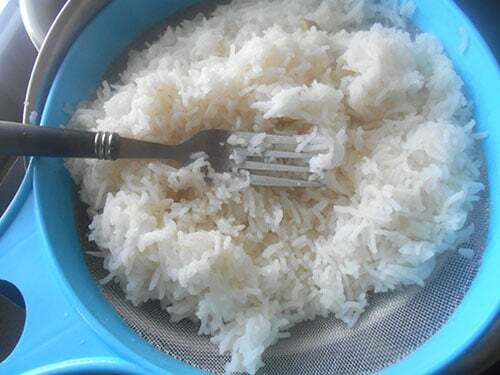 Many people don’t know that it is good practice to wash rice first. Makes a difference in the taste. I’ve never made rice in a pot without using a lid and I can’t wait to try your method! I’ve never seen it made this way! I’m looking forward to trying it! Thank you, Marye. I like making rice this way because that is the only way I know how to make rice, LOL. Just the washing alone tips are super helpful. It’s so refreshing to learn the basics!!! Thank you, Nic. Washing also takes away some of the harvest taste. Thank you, Sharon. I hadn’t heard about Arsenic in rice. The rice I buy comes from Indian stores and they are always bagged from the source. I like using more water in the rice because it makes it fluffier. 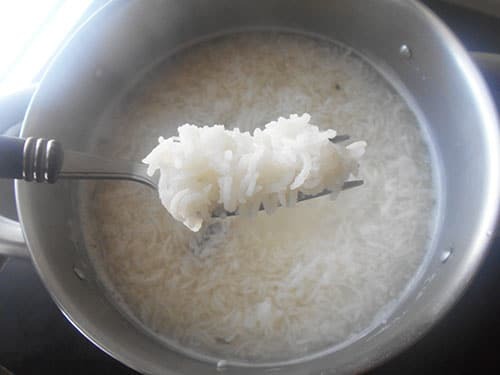 My rice is normally white unless I add a little extra oil. This days, I have stopped putting the oil. Basmati is the only rice I eat, white and brown. I just prefer the flavor and now I have to try this recipe. Love it. Thank you so much, Janette. It is so nice to hear you say that.